The canals at Waterford of the Carolinas were built to enhance the affordable home sites, but they also provide water paths to the grocery store, doctors' offices and restaurants. In fact, if you're driving a small electric trolling motorboat (smaller than 16') or paddling a kayak, you can easily navigate to about 90% of the waterways, canals and lakes in Waterford. The community is comprised of 19 small neighborhoods, each protected by a privacy gate, yet completely interconnected via a series of recreational pathways, bridges, and streets that allow residents to walk and bike throughout the community. Just five minutes from Wilmington's historic downtown, the USS NC Battleship, and the Cape Fear River, Waterford offers convenience and affordability without sacrificing on views or amenities. Waterford of the Carolinas is in the heart of Leland, right off the main artery of Highway 17, allowing residents to easily connect to the larger cities of Wilmington and Myrtle Beach or to the neighboring small towns of Belville, Supply, Navassa, Winnabow, and Bolivia. Whether you're seeking art and culture or a rural road with farms and natural beauty, you'll be there in minutes! The commercial real estate flanking the Waterford entrance on the Highway 17 corridor is the area's fastest-growing business district. Residents can walk, bike, boat or drive to the Harris Teeter grocery store, a Rite Aid pharmacy, five banks, several restaurants, quaint boutiques, a coffee shop, a dry cleaner, an animal hospital, hair and nail salons, an independent bookstore, the liquor store, the House of Wine and Cheese, and more. An ever-growing roster of medical service providers offer everything from urgent care and dental care to pediatrics, plastic surgery, and chiropractic care. Professional offices include builders, developers, financial advisors, insurance agents, attorneys, engineering firms, and the Chamber of Commerce. The Holiday Inn & Suites is ideal for visiting friends and relatives. Wal-Mart and Lowes are just across the road. From May through August home-grown products are available for purchase at the Farmers Market in Leland Municipal Park (every other Sunday from 11am-3pm). Enjoy locally raised fruits, vegetables, berries, dairy products, honey, preserves, baked goods and seafood as well as herbs and flowers. Inside Waterford, a stately clubhouse with a resort-style pool (complete with wade-in beach and cabana bar!) takes center stage literally sitting in the middle of the community's large round-about. The clubhouse also boasts a media and game room, a library, a kitchen, a fully-equipped fitness center, four Har-tru lighted tennis courts, and a sandy beach with a volleyball court. Waterford also has an event lawn area and a children's playground. 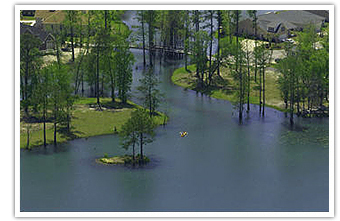 Residents can boat, kayak, canoe or fish along the 17 miles of shore-lined lakes and creeks; walk miles of expertly maintained hiking trails; or cruise along the bike trails. There's also a conservation area and a lakeside picnic area with grills. And, of course, a number of championship golf courses and ocean beaches are in close proximity to Waterford. 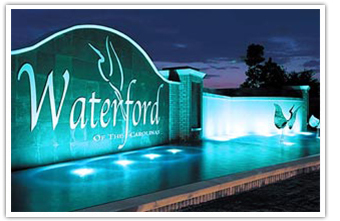 Waterford of the Carolinas is more than just a neighborhood. Whether you need to make a quick run to the grocery store or you want to enjoy a leisurely afternoon of swimming at the clubhouse, everything is just a golf-cart ride away. Waterford prides itself on a vibrant sense of community, with residents who seem to be as closely connected as the series of waterways and canals that join each neighborhood. Residents of Waterford of the Carolinas have their own website where registered users will find regularly updated information on activities and committees in the community. Residents can also elect to receive Waterways Magazine, a community magazine, brought to their front door or delivered electronically, via a Yahoo distribution list. The Waterford of the Carolinas community was designed to capture the essence of relaxed, southern charm with boulevards winding outward from the central clubhouse and recreation center. Developers have successfully balanced a feeling of seclusion in each of the nineteen small neighborhoods of Waterford while maintaining the atmosphere of a close-knit, inviting community. There are more than 15 groups, clubs and organizations for Waterford's residents including: Mah Jongg, Bridge and Bunco groups, book clubs, tennis, fitness, senior golf, fishing, kayaking and gardening groups, a dining club, a travel club, a neighborhood watch group, and a Bible study group. In addition, members of the Waterford community regularly host neighborhood get-togethers to celebrate holidays (or any other occasion, for that matter!). Mild coastal temperatures, ample amenities, water views, a strong sense of community, and an affordable, convenient lifestyle—that's the checklist for most empty-nesters, pre-retirement families and retirees. And, Waterford of the Carolinas earns high marks on every account. With almost every home on the water, Waterford of the Carolinas is a haven for water lovers desiring a beautiful, affordable home that's close to everything. Retirees love the prime location, the established amenities, and the exceptional value of a strong real estate investment. It's easy to see why so many people are choosing Waterford as the perfect home for their golden years. In fact, the developer of The Reserve at Waterford specifically stated that it was "designed to meet the needs of retiring baby boomers." From grand estate homes to low maintenance vacation properties, the diverse selection of properties for families, seasonal residents, and retirees is exceptional. Yet, despite such diversity, whether a patio home or a custom home, each option has the comforts and southern sensibilities that will bring resort living right to your front door. Waterford offers several options for beautifully designed low-maintenance patio homes and townhomes, all of which offer maintenance-free lawns, a place on the waterfront, gated communities and all-brick construction. With several floor plans available (most featuring spacious first-floor master suites), buyers can customize both exterior and interior elements to suit their individual needs and preferences. Many homes feature oversized front porches, 9-foot ceilings, hardwood flooring, fireplaces, designer kitchens, and lushly landscaped yards with full irrigation. All homes are energy efficient. Models are open daily for inspection and purchase. Waterford is also a beautiful location for an exceptional primary residence or second home retreat with home prices ranging from $250,000 to $700,000. Spacious and inviting designs in a variety of architectural styles are loaded with southern charm and amenities such as 9-foot ceilings, hardwood floors, granite countertops, gourmet kitchens, flex rooms with baths over the garage, large, roomy, laundry rooms, screened porches and more. Whether you choose a town home, single family home, a custom estate, or the ever-popular patio home, you'll enjoy all of the convenience, conviviality, and amenities that Waterford of the Carolinas has to offer. If you would like to be a part of the Waterford community, please Contact Us today. Ready to Search for Waterford Homes for Sale? Great! Let's find a home for you!